Bortezomib is a preferred yet costly drug in multiple myeloma (MM) treatment. Thus, despite its benefits, bortezomib is substituted with cheaper options like thalidomide; sometimes compromising the efficacy of treatment. This case report of a 53-year old transplantation eligible MM patient from Colombia shows that substituting branded bortezomib with its generic version in the bortezomib, cyclophosphamide and dexamethasone (CyBorD) regimen can also help in complete remission. This case provides evidence that high quality generic drug is as safe and efficacious as the innovator product. Improving awareness about clinical and cost saving benefits of generic medications in oncology practices could make cancer treatment affordable for many patients in lower and middle-income countries (LMIC) like Colombia. Clinical usage of generic drugs similar to that of their branded/innovator counterparts is the need of the hour. Adequate policies along with transparent and ethical promotions must be implemented to ensure maintenance of high quality care at an affordable cost. Multiple myeloma (MM), even though a rare heterogeneous disorder, is the second most common hematological disease worldwide 1 2 , 3 . Among the Latin American countries, Colombia has the highest average incidence of MM with heterogeneous incidence patterns 4 . The incidence rates per 100,000 inhabitants, for those aged more than 60 years, were 14.2 and 12.8 for men and women, respectively. Further, MM related mortality has shown increasing trends across all Latin American countries including Colombia (2.0% [95% CI: 1.1; 2.8] in men; 2.8% [95% CI: 2.0; 3.6] in women) 4 . In low- and middle-income countries (LMIC) such as Colombia, the MM incidence and its high mortality show heterogeneous patterns. This could be due to limited access to diagnosis and treatment 4 . Thus, providing cost-effective quality care is a significant health-care challenge in MM, especially in LMICs, where the monthly cost of cancer treatment often exceeds the annual income 4 , 5 . Bortezomib is a preferred drug in MM treatment with good clinical outcomes, used in combination with either lenalidomide or cyclophosphamide, along with dexamethasone in multiple settings (transplant eligible, non-transplant candidates and recurrent MM) or as maintenance monotherapy 6 , 7 , 8 . Cost-effectiveness analyses (CEA) show that bortezomib-based regimen is the most cost-effective treatment for MM 9 . However, bortezomib is also the major cost component of bortezomib-based regimens 10 , 11 . Hence, using generic versions of bortezomib can reduce the treatment cost of MM. Several estimates and comparisons highlight the fact that using generic equivalents of originator drugs can significantly reduce the cost of cancer therapy 12 , 13 , 14 , 15 . A 2015 study in Colombia showed significant cost saving with the use of generic versions of bortezomib (63%; $4.68 million), decitabine (26%; $0.29 million), and capecitabine (46%; $1.50 million) 12 . Estimates from high income countries were also similar. In England, compared to the list prices, generic prices of four cancer drugs (bortezomib, dasatinib, everolimus and gefitinib) showed a 74% to 99.6% reduction in treatment cost 13 . An Intercontinental Marketing Services (IMS) Health (now a part of IQVIA) study of the United States (U.S.) health care system showed that use of generic drugs saved $1.07 trillion over the past decade 15 . Though cost containment is a desired goal in cancer treatment, it should not be the only consideration. Other very important considerations are quality of care and an optimal outcome. According to the World Health Organization (WHO), cost and quality of generic drugs should go hand-in-hand in improving treatment outcomes 16 . It has been shown in several comparative studies that generic drugs are equivalent to their innovator drugs with similar efficacy and safety profile 17 , 18 , 19 , 20 , 21 . Yet, both physicians and patients alike have concerns about the effectiveness and quality of care with generic drugs 14 , 16 , 22 . To address this concern, a case report from Colombia is presented here which shows that use of generic bortezomib, in the bortezomib, cyclophosphamide and dexamethasone (CyBorD) regimen in transplant eligible MM can cause complete remission, similar to the originator drug. A 53‑year old married Hispano/Latino female, consulted our clinic because her test results showed myeloma. She was diagnosed with solitary plasmocytoma three years ago, after complains of pain in sternum and ribcage, and was treated with 10 radiotherapy sessions in 2016. Other than this, she had no significant past medical history. Since her radiotherapy, she had been asymptomatic with no alterations in laboratory parameters. During her July 2017 follow-up, MM was suspected because of IgG lambda band in monoclonal immune-electrophoresis and lytic lesions in humerus, femur and skull. 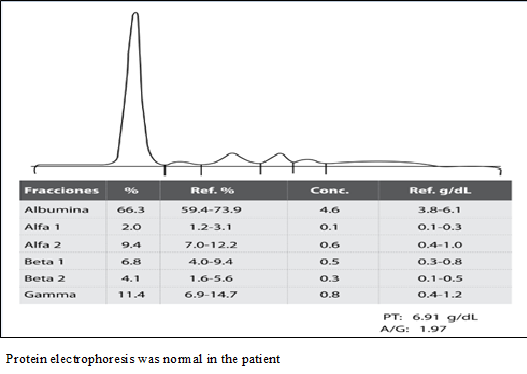 However, serum protein electrophoresis (SPEP) Figure 1 was normal. The serum lambda free light chains (1.47 mg/L) and kappa free light chains (2.73 mg/L) were normal. Kappa/lambda ratio was also normal at 1.86. Blood counts, creatinine, and lactate dehydrogenase were also normal. Bone marrow biopsy, myelogram, and flow cytometry were requested to confirm the diagnosis. 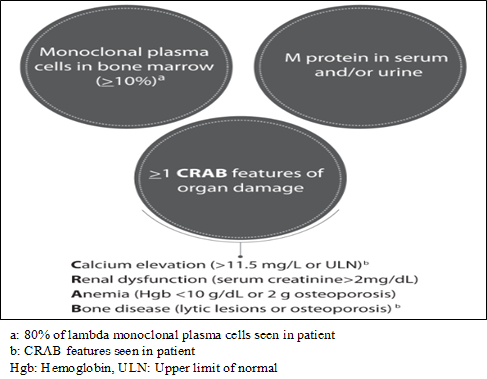 Myelogram showed 34% of plasma cells, and flow cytometry in bone marrow showed 4% pathological plasma cells and 80% of lambda monoclonal plasma cells, which was confirmed by immune-histochemistry with bone marrow. Serum calcium was raised. Her medication history for last three months did not register any transfusion, bone modifying agents, growth factors, thromboembolic prophylaxis, pain medications, antidepressant medications or therapy against herpes zoster. Also, she was HIV and hepatitis-C negative with no history of myelodysplastic syndrome. 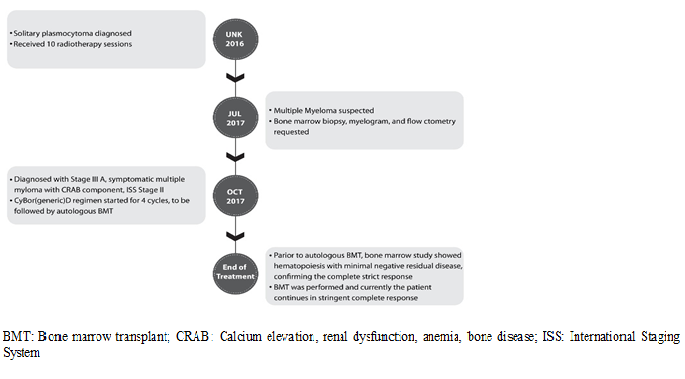 In October 2017, the patient was diagnosed with Stage III A, symptomatic MM with CRAB component (hypercalcemia, osteolytic lesions) Figure 2 , and International Staging System (ISS) stage II Table 1 3 , 8 . The CyBorD regimen was planned for four cycles followed by autologous bone marrow transplant (BMT). Dexamethasone (40 mg/day) was started four days prior to systemic chemotherapy. During each cycle, the following medications were given: generic bortezomib (by Dr. Reddy’s Laboratories, 2.5 mg subcutaneous [sc]) cyclophosphamide (500 mg intravenous [IV]) and dexamethasone (40 mg IV) on Day 1, 8, 15, and 22; and zoledronic acid (4 mg IV) on Day 1. She was started on acyclovir (400 mg every 12 hours) as prophylaxis against herpes zoster and morphine (10 drops every 6 hours) for pain control. After third cycle of CyBor (generic)D chemotherapy, the patient achieved stringent complete response. Relevant tests on February 19, 2018 were normal. There was no evidence of M spike on serum immunofixation and no monoclonal spike was seen on SPEP. Serum kappa chains (5.54 mg/L) and lambda chains (4.64 mg/L) were normal. The kappa/lambda ratio was normal at 1.19. Bortezomib (as a single agent or in combination) is the preferred regimen for the treatment of MM, both in primary as well as maintenance therapy 7 . This case report of a 53-year old female patient with stage IIIA MM with CRAB component highlights the treatment effectiveness of CyBorD regimen where innovator bortezomib was replaced by generic bortezomib from Dr. Reddy’s Laboratories (CyBor[generic]D). The patient was eligible for transplantation and therefore received CyBor (generic)D regimen through subcutaneous route as per NCCN guidelines 8 . The patient achieved strict complete response with four cycles of CyBor(generic)D.
All the guidelines for managing the case were strictly followed. Re-activation of varicella zoster virus is a common adverse event with bortezomib therapy and can be prevented with acyclovir therapy. Hence as per the International Myeloma Working Group (IMWG) consensus approach to the treatment of MM patients who are candidates for autologous stem cell transplantation, this patient also received acyclovir therapy 23 , 24 . Treatment of MM is very expensive as it requires multidrug combinations followed by prolonged maintenance therapy. Also, with improved patient survival (median of >7-10 years for standard-risk patients), the cumulative lifetime costs of care increase significantly 25 . Usage of bortezomib-based regimens, though preferred in MM, is limited in LMICs due to high costs and lack of funds. Since thalidomide is substantially cheaper, cyclophosphamide, thalidomide, and dexamethasone (CTD) is used for induction while thalidomide-based regimens are used for maintenance therapy 12 . However, this compromises the treatment outcomes in the patients and highlights the need of replacing originator drugs with cheap generic drugs. Generics are bioequivalent to the innovator drugs and they are as efficacious as the innovator 14 , 16 , 22 . This is well supported by various literature studies. Generic and branded levofolinate showed similar tumor response rate in colorectal cancer patients on combination chemotherapy of levofolinate, 5-fluorouracil, and oxaliplatin with or without bevacizumab. The efficacy rate (complete response plus partial response) for generic and branded drug group was 50% and 42%, respectively (odds ratio: 1.400, 95% CI: 0.409-4.788, p = 0.756). The incidence of adverse drug reactions between the two groups was also not significantly different 17 . Also, generic and innovator versions of imatinib have shown similar safety and efficacy in the treatment of chronic myeloid leukemia with similar hematological, cytogenetic, and molecular responses 18 , 19 , 21 . These comparative studies well support the fact that generic versions are as safe and efficacious as their innovator product. Along with their being efficacious, substantial cost saving with generics also translates into long-term adherence to treatment 26 . Clinical Guidelines Committee of the American College of Physicians advises clinicians to prescribe generic medicines in place of expensive branded medicines 26 . Therefore, generics can provide a cost-effective treatment option in oncology where medications are very expensive 27 . However, despite the obvious benefits of generic medications, both physicians and patients have concerns about the effectiveness and quality of care with generic drugs 14 , 16 , 22 . This could be due to absence of policies that target population’s beliefs on generic drugs, absence of transparent and ethical generic drug promotion, and lack of regulated and policy-oriented incentives to doctors and pharmacists 22 , 28 , 29 , 30 , 31 , 32 . Better policies accompanied by comparative cost-utility and patient health outcomes studies must be in place to promote generic drug prescription 32 , 33 . It has been witnessed that in India, government initiative of running exclusive generic drug outlets or “fair price medicine shop (FPMS)” inside government hospital premises improved the perceived effectiveness, safety, and adherence to generic drugs compared to drugs purchased from open market retailers 30 . This shows that both doctor and public perception can be improved if policies and solutions to promote generic medications are built considering the various factors that affect the perception towards generics 34 . Further, patients who are less educated and are in lower income bracket (such as in LMICs) are more likely to have less positive views on safety and effectiveness of generic drugs than their relatively higher income and educated counterparts 22 . Thus, implementing the right policies to increase generic prescriptions and patient awareness could improve treatment access for those who cannot afford branded medications 22 , 28 , 32 , 33 , 34 . Thus, the present case study showing complete response with generic bortezomib is an endeavor in this direction. This case study highlights that replacing innovator bortezomib with its generic version in the CyBorD regimen did not compromise the efficacy of MM treatment and the patient achieved complete remission. Generic medicines, apart from being safe and effective as their branded counterparts, have the added advantage of being substantially cost effective. This benefit in-turn holds immense value for patients, policy makers, and physicians. LMICs like Colombia can improve their access to quality cancer treatment by using generics and therefore, physician and patient perception regarding the safety and efficacy of generic medications must be improved in an overall level. Implementation of right policies, ethical promotion of generic drugs, and launch of public awareness programs and government certified generic drug outlets can pave the way towards better and affordable cancer treatment.